The Mutual Mine Recreation Area is a part of the 50,000 acre Citrus Tract of the Withlacoochee State Forest. It is located south of Inverness just west of Pleasant Grove Road on forest road Trail 16. This area is also part of the Citrus Wildlife Management area where hunting is allowed. It's always a good idea to wear bright colored clothing during hunting seasons. 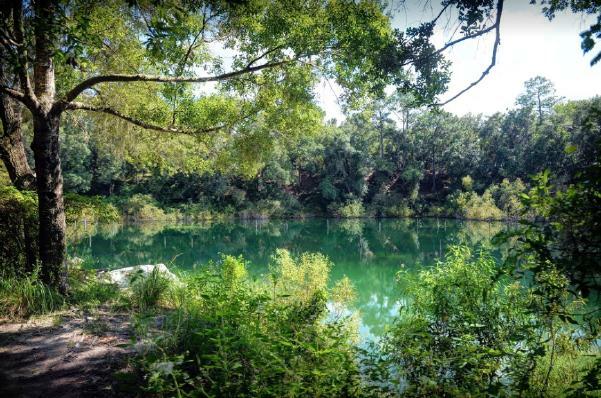 The campground at Mutual Mine Recreation Area contains 13 campsites in a horsheshoe arrangement around a lake that has formed in an old phosphate mine pit. As the area has reverted back to its natural condition, the lake and surrounding mounds are quite picturesque. Swimming is allowed in the lake. And there are reportedly plenty of fish. There are restrooms available at the campground, but no shower facilities or electricity. Note that NO pets are allowed in this campground. The Mutual Mine Recreation Area also includes a youth group campsite that can accommodate organized groups of up to 50 people. There is a connector to two long loop trails at the Mutual Mine Recreation Area. You'll walk about a mile and half to two miles to meet up with these trails, either of which is suitable for overnight backpacking. The Citrus "C" loop is 13.5 miles long, and covers the midsection of the Citrus Tract. The Citrus "D" loop is about the same length, and loops to the south around the Tillis Hill Recreation Area. There is a first-come, first-served primitive camping area along each of these trails. Both trails wind through a variety of natural communities, including sandhill scrub, longleaf pine stands, and rocky hammocks. lowland portions may be wet during rainy season. The Florida National Scenic Trail also winds through this area from north to south. You can reach it by hiking west from the Mutual Mine campground on the connector trail that joins the Citrus "C" and "D" loops.